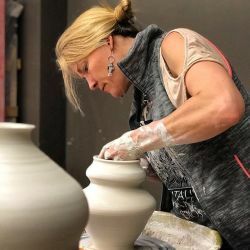 "Bringing the Healing Power of Art to Homes and Public Spaces"
Natalie Blake began her professional career in 1994, creating her unique line of carved vessels and hand sculpted lids in southern Vermont. Her work quickly gained exposure through art shows like the Smithsonian Craft Show and the American Craft Exposition. In 2002, Ornament Magazine described her work as an "extraordinary collection of pottery consisting of brilliant blue-green glaze and fine detailed carving, which are her trademark. Each piece has an ancient as well as contemporary feel." Natalie has continued to expand her inventive line of vessels while also developing her unique line of sculptural wall art tile. She welcomes custom orders and works closely with homeowners to designers to make unique pieces of art that is perfect marriage of their aesthetics and their budget. Based in the small New England arts town of Brattleboro, Vermont, Natalie's studio is part of Fire Arts Vermont, a collaboration between Natalie Blake and Randi Solin (Solinglass).